That being said, occasionally we also have the issue of finding the RIGHT piece of furniture or decor to finish a space, and that's where the more extensive DIY portion of what we do comes in. When we were building up our entryway nook I realized that we were never going to find storage crates the exact size we needed them to be, so out of pure necessity, we figured out how to build some! The same thing happened when we started working on my office in the basement. There was limited space and I had very specific needs for all of the stuff I wanted to store, so I knew that we were going to have to repurpose and rework existing budget-friendly storage units and build up around them. 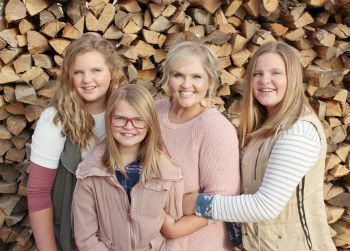 It's not like I go crazy about it, because life gets busy and I don't have all the time in the world to be refinishing and revamping every little thing I place in my house, but there ARE items that I know can make a huge statement, with just a little bit of TLC. 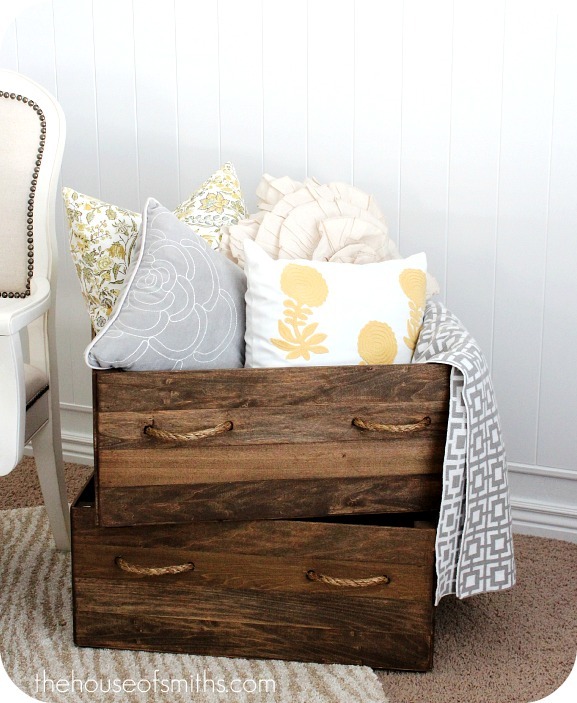 I love this quick coffee table restyle from Kiersten over at Mod Mom Furniture. She takes an inexpensive, store-bought coffee table and turns it into a mid-century modern masterpiece with just some new hardware and a little Cabot Premium Wood Finish. See the video below for the full tutorial. 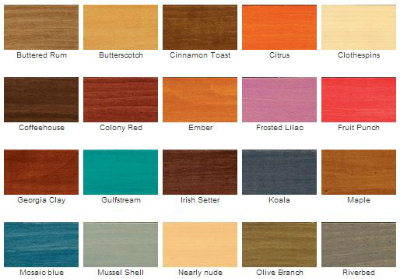 You can check out the new Cabot Premium Wood Finishes online or exclusively in Lowe's stores. There are lots of traditional, as well as on-trend colors to choose from. With Cabot's blotch-free formula, fast drying time and simple soap and water cleanup, it's definitely an ideal wood finish to use for a quick furniture restyling project, like this coffee table or even our simple DIY spice packet organizer. 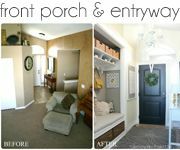 I'm a sucker for personalized little makeovers and DIY projects like these from time to time, because they're fast, easy and can have a huge impact in your space. 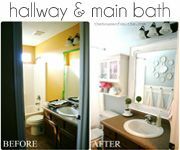 Plus, just changing out a few features, or adding a certain color paint or stain to something can really tell people a lot about your personality and homes overall style. Do you have a thrifted, handed down or just old, outdated piece of furniture that you've decided to keep and restyle, instead of getting rid of? 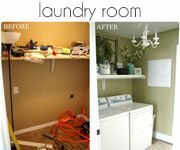 OR, What sort of things have you repurposed, altered, or created to help customize a space in your home? We'd love to hear! I have an old storage chest that I would love to re-purpose/re-style. The paint on it is chipped, the back is all sorts of warped, and some parts of decal are missing. I have a vision for it, I have a new purpose for it, just lacking some time to do it at the moment. 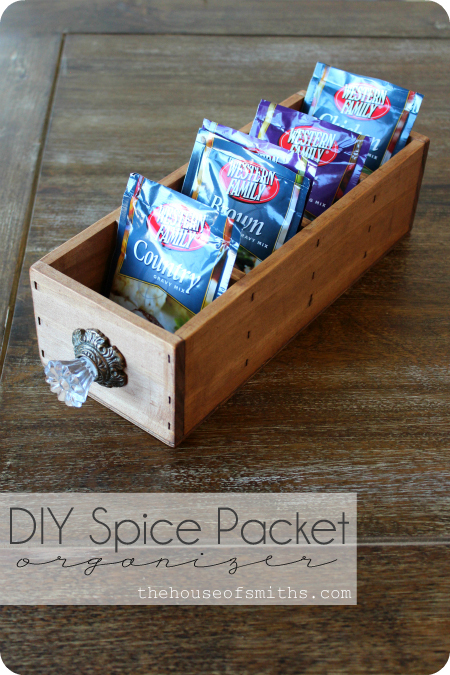 And love the idea of a spice packet organizer, I'm using something very similar in the kitchen! If mom (we are currently living with my mom) lets me do it. The two of us have somewhat differing tastes, and she isn't exactly into re-purposing old furniture. I should have some free time next weekend... but talking her into it is another story. 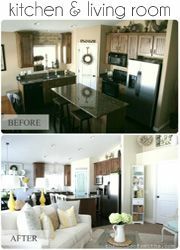 I love your ideas and restyling! Recently I found a very little cabinet at bulk garbage and painted it white. Although it looks great now, it still stinks abominably when you open it. Do you have any recommends what I could to against that smellig? Vinegar did not help. Oh shoot, hmmm, maybe you could put some baking soda in there to help absorb some of the smell, or possibly some dryer sheets to even "change" the smell up a bit? What if you aired it out for a few days? woudld that help? I inherited a dresser from a relative of mine that smoked like a chimney. It took some work, but I finally got it smelling normal. First, I suggest cleaning the inside of the chest thoroughly. I cleaned the inside of the dresser with simple green at least twice. Then, I would let it air out as much as possible, maybe even leaving it outside for a while. I put a ton of dryer sheets in with my clothes, which helped a ton. Some combination of that and baking soda should hopefully help! I hope you don't mind me jumping in here...I use a box of baking soda and if there is no room for a box I dump it in to a recycled jam jar. I also just read in this months Real Simple that a piece of charcoal will work as a deodorizer and "clear the air in a musty dresser..." I'd give both a try!If that doesn't work you could always paint the inside with a deodorizing paint. My husband and I moved into our home without ever having done the apartment stage or even the college dorm stage, so we had not a lick of furniture between us. My in-laws gifted us with a round wood dining table and four chairs that had lived in their flood-prone basement. After dealing with the high water marks for a few months, I broke out some homemade chalk paint and painted the chairs and table. Now they are one of my favorite pieces! YAY! I love that! 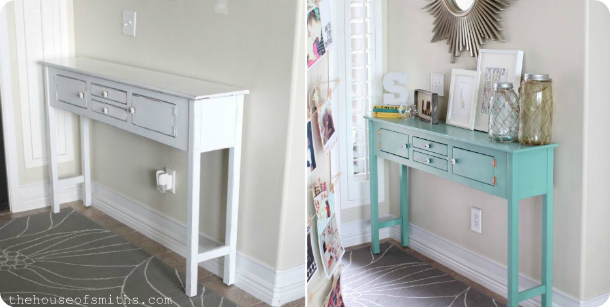 What a great story of a restyled piece :) I need to try out some chalk paint! Everyone is talking about repurposing furniture today! We haven't started it yet, but we got some amazing custom millwork from a home my father sold - the buyers just wanted it gone and asked him to remove it, in exchange he kept the gorgous cherry cabinetry and we'll be able to install it to create a window bench and bookshelves in our living room! Ooo! That will look awesome! I'm in LOVE with window benches, they're so cozy looking! Hi!!! 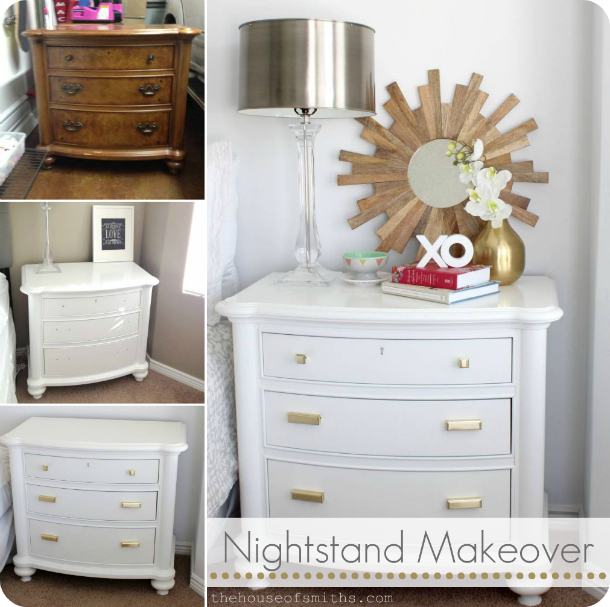 I love love love the white nightstands! Can you PLEASE tell us the brand/color/finish of the white you used? I've painted 2 things white recently and instantly regretted the color choice! Please help! Love your blog! Just love a good transformation! 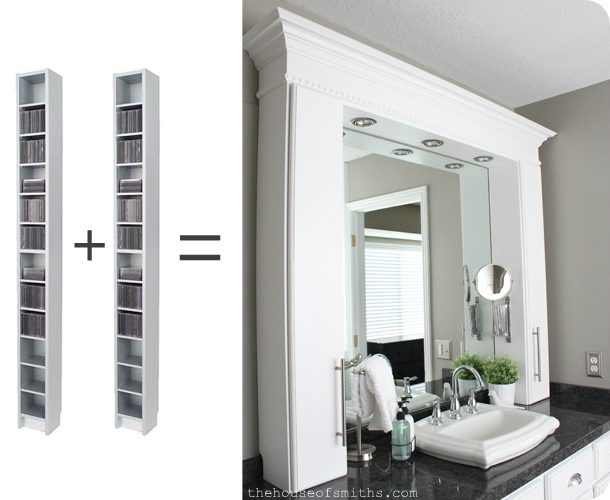 That bathroom countertop storage is genius! Seriously! Thanks for sharing. I have an old hope chest sitting in the loft. It's pine but has that shiny, funky protection on it. Do you know what I mean? I'd love to paint it and change it up as a bench seat fot the entry way. i have a pine hopechest in the loft, It was my mom'm. It has some funky shiny protection on the wood. Do you know what I mean. I need to figure out how to paint it because I would love to use it as a bench seat in the entry way. Now I have some old sewing machine drawers that are stained dark brown. If I want to restain it how do I do that?